Preheat oven to about 210ºC if fan-forced) and roast in a single layer peeled and cubed pumpkin well coated in olive oil, salt and pepper (15-20 minutes). After removing the pumpkin and with the oven temp on low add the pecans and lightly roast (approx. 5 minutes). Meanwhile add penne to a saucepan of lightly salted boiling water and cook for approx. 10 to 12 minutes until al dente (slightly chewy to bite). Drain.. While the pasta is cooking heat remaining oil and butter in frying pan and quickly fry whole sage leaves over a high heat for about 1 minute (remove) then lower the heat and gently fry garlic until softened. 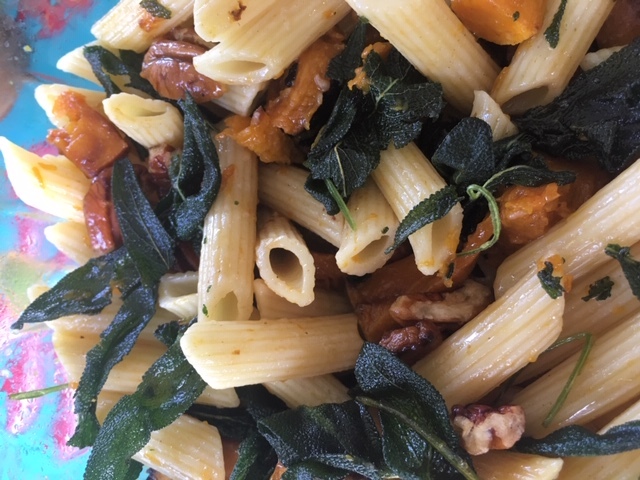 Add sage and garlic to well drained pasta and stir through the roasted pumpkin and pecans. Gently fold through until all ingredients are well distributed. Serve in bowls sprinkled with grated parmesan if desired. It is also delicious without any parmesan.